"Located on the coolest street in America this Architectural masterpiece is an entertainment showplace. Light and bright with high ceilings and expansive volume with hip industrial touches, top of the line finishes and extensive use of natural stone and wood elements. The entry level highlights a massive chef's kitchen with dining area and walls of glass opening to a living wall and bubbling spa. The step down living room showcases lush atrium-like views and a stunning outdoor waterfall. Two additional levels are topped by a spectacular rooftop deck with outdoor kitchen, lounge area with fire pit and knockout close up city views of Abbot Kinney to the hills of Malibu. The expansive master suite features high ceilings and fabulous master bath. A rare offering in a unique location steps from the hippest shops, gourmet restaurants, and incredible nightlife. A striking trophy residence walking distance to the beach and in the heart of the Venice version of New York City's SoHo." "This rare and exceptional offer is on over 35 feet of Venice sand frontage on prime Ocean Front Walk and is a stunning L. Anthony Greenberg Architectural. A doublewide floor plan with top-of-the-line finishes makes this property the premiere and largest unit at Ocean Front Townhomes. Sensational ocean views of the Pacific, dreamy stretches of sandy beaches, and palm trees lining the Santa Monica Mountains provide an outdoor space that is simply breathtaking. With over 3,500 square feet of living space, a 1,000 bottle wine cellar, private 6-car parking for the auto enthusiast, and an exceptional location convenient to all the best Venice and Santa Monica beaches have to offer, this magnificent property is simply unsurpassable!" "The refined European esthetic & intuitive approach to space of the Hoff-Genoist design team are reflected in this remarkable private oasis with guest house in the heart of Venice. Their unparalleled eye for design is apparent in every detail, from the solid walnut floors to the live-edge bar, architectural staircase, spectacular fixtures, one-of-a-kind built-ins & lush landscaping. Enter through your private courtyard into a refined yet warm living & dining space, to a huge chef's kitchen that is truly the heart of the home. The large patio is ideal for entertaining with a seamless indoor-outdoor flow that you will enjoy day & night. The deck wraps around to a large grassy yard, & if you're looking for 360 views, take the stone-clad stairway tower to the huge roof-deck. In addition to the 5-bedroom main house, there is a sun-drenched 2-bedroom guest house with views. Complete with 4 car parking, and walking distance to Abbott Kinney the beach, this house is incomparable." "The Broadway House, by Noah Walker, AIA, the visionary behind the Oak Pass House. As featured in Architectural Digest, The Broadway House integrates a 1910 California bungalow w/ a modern day architectural, perfectly blending w/ Abbot Kinney's vision of artistic westside living. Designed to reflect its natural surroundings, this 4 bed 4.5 bath layout is ideal for entertaining & sophisticated living. Soaring ceilings & an abundance of natural sunlight create a bright interior accented by sleek lines & rich natural woods. A chef's kitchen is centered by a waterfall island of beautiful Grigio Collemandia marble, opening up to a grand family room & patio deck. A fully finished garage acts as a perfect bonus room, transitioning the outdoor spaces together w/ ease. Upstairs, the master suite boasts views of mature palm trees, w/ a spa-like bathroom lined in timeless bookmatch marble. Moments to the ocean & local hot spots, The Broadway House offers both a classic & vibrant Venice lifestyle." "Duplex! Remarkable cutting edge Modern/Beach Property setting the highest standards with no expense spared, this Modern House is currently one of the best offerings in all of Venice Beach. With approx. 4,518 sqft of living space, 5 bedrooms and 4 baths, an open floor plan designed for entertaining that seamlessly intergrates the beach vibes with a full roof top patio with views on views on views! This home offers the feeling of privacy and space that you will not find anywhere else. The master bedroom is the perfect retreat with over 500 sqft, a fireplace, and tons closet space and a huge walk in closet. Top of the line amenities include Thermador appliances, pantry, shelving, homework area, hardwood floors, laundry room, dog run, lutron lighting system, 5 garage spaces +driveway with room for all your toys, an abundance of storage, and so much more. With too many features to list, this home is truly a complete offering. This A location is centrally located in Venice Beach, A few steps to the beach, shopping, restaurants and all Venice Beach has to offer. Pictures to be listed 1/6"
"Stunning views await you in this beautiful new home located on the coveted Venice canals. Enter into a timeless open floor plan that has exposed reclaimed wood beams that adorn the entire downstairs ceilings. The gourmet kitchen is well appointed with high-end appliances included a Wolf double oven, 6 burner stove, and a built-in wine cooler that will make all chefs' feel welcome. Accordion iron sliders open to the canal to create acomplete indoor/outdoor experience from the living area to the patio, which includes a built-in fire pit. Step upstairs and be greeted by an ample sitting room that leads to the three spacious bedrooms. The master suite's floor-to-ceiling windows open up to your private balcony that is perfect for enjoying great canal views, the tongue and groove Aframe wood ceilings drape the master bedroom adding esthetic old world charm. Thishome's design is straight out of a Restoration Hardware catalog and won't last long!" "33 20th Avenue defines modern luxury. Silicon Beach 3 bedroom 4 bathroom architectural masterpiece designed by William Adams with SMART home technology is located on a desirable Venice walk street and just a stone's throw to the sand. The home has a stylishly open floor plan featuring soaring ceilings and over sized windows letting in natural light and ocean breezes. A sleek and sophisticated gourmet kitchen with Miele appliances and Bulthaup cabinets awaits. The expansive master suite leads to a marble accented shower with soaking tub, and includes a private loft that leads to the outdoor lounge area. With design and functionality in mind, there are two separate living spaces and an additional loft leading to the outdoor lounge area. Rooftop deck with ocean views has a custom designed BBQ and hot tub where you will enjoy the sunsets, creating a perfect space for entertaining or relaxing. 33 20th Avenue is the ultimate home for indoor/outdoor coastal living." "One of Venice's most charming Craftsman compounds. A half block to the beach on a beautiful walk street, this rare 1908 property exudes character and elegance. A meticulously restored 4 bed/3.5 bath main house, 1 bed/1 bath guest house & studio apartment provide flexibility to either live in as a owner-user or rent out part/all of the units. A gate & maturely landscaped front yard with hibiscus & lemon trees welcome you to an inviting porch & grand foyer. A generous living room opens to a sunroom & deck overlooking the yard. Original details throughout include Douglas fir & red oak flooring, stained glass cabinetry, vintage light fixtures, wainscoting & a white brick fireplace. A recently renovated kitchen includes a subzero fridge & stainless appliances. The property offers updated plumbing & electric, newer roof & restored vintage windows, doors & fixtures. A truly special property and quintessential Venice lifestyle just moments from Abbot Kinney." "Huge Reduction! Best priced deal in prime 90291 zip code. Extensively renovated in one of the best walk streets of Venice. Featuring an excellent unit mix of mostly 2 bedroom and 3 bedroom units with significant rental upside. Ample onsite parking. Units feature hardwood floors, spacious kitchens, laundry, and much more. Delivered vacant." "Grand Canal Contemporary Craftsman: This stunning waterfront home artfully blends high end modern with ageless architectural aesthetics. Seconds from the sand, ocean and iconic Venice surf break, moments to the Marina and Abbott Kinney, this warm privately set home is casual beach living at its best." 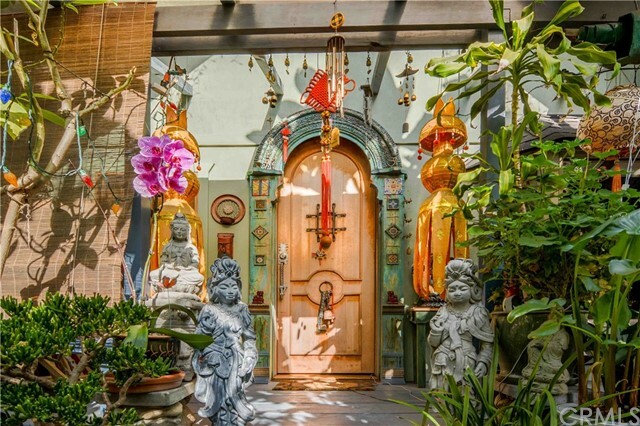 "If a picture can say a thousand words, than this custom built Venice home with an eclectic appeal and design provides it all. Showcasing Douglas Fur high ceiling structural one pine wood beams with saw size style, Brazilian teak arch doors, oak wood flooring on main level with French knot inlay, Moroccan star inlay with luxury fireplace mantle, Anderson bay windows, Vintage therapy bathtub, large backyard for additional development potential and much more." "Beautiful newly redone home minutes from Abbot Kinney and hip Rose Avenue dining and shopping. Beautiful open floor plan with fabulous indoor-outdoor living. Perfect for entertaining. Indoor flows perfectly to the outdoor manicured large back yard. Fabulous high ceilings throughout the house and vaulted ceilings in the stunning master bedroom. Lovely detached guest house with a separate kitchen, bedroom, bathroom and walk-in closet." "First time on the market in over 50 years! Extremely rare, single-family residential zoned property in one of the most coveted pockets of Venice. This 13,678 square foot corner lot is primed for a developer or owner-user to completely re-imagine the site. Just blocks away from trendy shopping and dining on Abbot Kinney Blvd, 1 mile from the beach. Located directly across the street from world renowned architect's residential/arts compound... This is a once in a lifetime opportunity. Property is sold as-is. Probate Sale. Court Confirmation required." "Incomparable brand new modern home just completed in Venice! Smart home features throughout, this property is the ideal lifestyle for the Silicon Beach buyer. Boasting over 3600 sqft, the house includes 4 bedrooms 3.5 baths designed for indoor/outdoor living and entertaining. Just 5 minutes away from Abbot Kinney and Venice beachfront, enjoy all the exciting lifestyle Venice has to offer! First floor enters to a spacious in-Law Suite complete with a walk in closet and private bathroom. This could be the perfect entertainment/theater room. Second floor is complete with a beautiful open kitchen, living and dining area surrounding outdoor corridor to encompass a sophisticated indoor/outdoor modern lifestyle. Third floor with gorgeous master bedroom, amazing bathroom amenities, and 2 spacious bedrooms with a shared bath. Fourth floor consists of a private rooftop deck complete with a hot tub for your enjoyment of the the city light view." "2 separate homes on 1 lot! This charming 3-story Venetian original features gorgeous restored hardwood floors, leaded & stained glass windows & original period features throughout.Step into the elegant foyer & your eye is immediately drawn to all of the beautiful architectural details that make this home unlike any other. Feel the character & warmth flow seamlessly from the spacious dining room into the kitchen.The adjacent living room is highlighted by a sunroom w/a marble floor, a remarkable & unique space in which to relax.The hardwood floors continue to the second story that features 3 generous BDS & an office/flex space to fit your needs, as well as a balcony w/French doors. Continue up the lovely staircase, noticing all of the detailed trim woodwork, to the 3rd story that has a studio BD & BA as well as access to the rooftop deck.The rooftop deck is the perfect space to enjoy your morning coffee or tea. 840 sq ft guest house above garage completely remodeled." 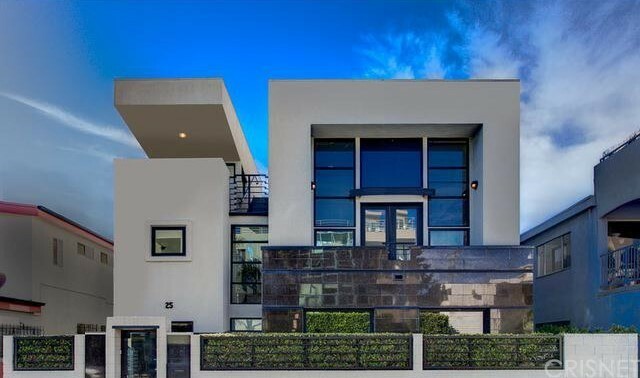 "Stunning modern awaits in this beautiful home on one of Venice's most coveted Walk Streets. Soft ocean breezes carry you through the tranquil and enchanting garden that greets you with Zenful vibes and are carried throughout this home. Floor-to-ceiling stacking windows allow this open floor plan to be filled with an abundance of natural light that invites indoor-outdoor living. Gourmet chefs will feel at home in the well-designed kitchen with the finest Viking and Subzero stainless steel appliances complete with a butler's pantry. The 2-car garage is located off the pantry for easy access. The sun-drenched master suite transcends you into a spa-like atmosphere with a beautiful concrete trimmed tub, rich wood cabinetry, Caesarstone countertops, his and hers double sinks, and a spacious walk-in closet. The home also offers 3 guest rooms, richly appointed and an en-suite with a wet room. The rooftop deck offers stunning sunsets." "Rare opportunity to own this beautiful 1912 Venice craftsman. No expense spared on the restoration of this iconic home. Restored from the foundation up, this home features the luxury of Wolf appliances, Carrera marble, imported Moroccan tile and high end fixtures throughout, while perfectly balanced with all of the original built-in wood work of the era. Gorgeous Acacia Walnut hardwood floors. Arguably, this home has one of the largest wrap around front porches in Venice, ideal for entertaining Sat. nights or peacefully relaxing Sun. mornings! Upstairs boasts 3 bedrooms and 2 baths. Downstairs features 1 bedroom and 1 bath, plus 2 additional bonus rooms, one of which is a stunning 1920's speakeasy bar and the other a beautiful classic sunroom. Formal dining room is emphasized with classic built-ins, and a large window with views of a breathtaking Buddha fountain. All of the electrical, plumbing, heating/air, roof, and security system have been updated. This home is not be missed!" "Designed by Robert Thibodeau of DU Architects, this stunning home located along Grand Blvd's Architectural Row in Venice is a true delight. Encompassing gorgeous design elements throughout, you'll love entertaining in the warm open floor plan featuring polished concrete floors, glass walls, and soaring redwood ceilings. The gourmet kitchen is a chef's dream with custom cabinetry, high-end appliances, integrated Caesarstone countertops, and beautiful Anne Sacks glass tiling detail. Two spacious guest bedrooms plus additional spaces ideal for an office or reading room fill the 2nd floor, while the entire 3rd floor is your personal retreat - the master suite. Open and airy with a spacious built-in closet and a chic master bath with dual showers and soaking tub, the master suite is truly magnificent. Savor in the ocean breezes on your two outdoor decks, complete with an outdoor shower and fire pit. Moments to the beach and Abbot Kinney Blvd's shops and restaurants, this is a must see!" "Celebrity Owned Charming Craftsman! Has both modern updates as well as original details. Location, Location, Location! Situated in the Heart of Venice's Abbot Kinney District. Be right in the mix of it all! Move right in! This home has been completely remodeled. A private gate welcomes you to the most charming front yard and sitting porch. This opens to the warm and inviting living room with hard wood flooring and cozy wood burning fireplace. Adjacent is the updated kitchen with custom cabinetry, vintage O'Keefe & Merritt stove and sub-zero refrigerator, stone counter tops and breakfast nook. The main level features two bedrooms and a den which could be used as a 4th bedroom. Upstairs is devoted to the spacious master suite with wood burning fireplace and master bath with claw foot tub. There are hardwood floors throughout. Serene sitting porches and a large backyard deck ideal for relaxing and entertaining. Landscaped by renowned Venice landscape architect Jay Griffith.Within blocks to Abbot Kinney fashion, shopping, tech/media, fine dining and the Beach." "This Venice Canal charmer has a classic Venetian vibe befitting its location. This light and bright home features an open floor plan with high ceilings, updated kitchen, 2 generous sized bedrooms, bonus room/office, 2.5 baths, rooftop deck and private permitted dock! Just step through the double doors and you will fall in love with all that the historic Venice Canals have to offer. Take a sunset stroll or simply dine al fresco on the garden patio. Don't forget to check out the second floor where you will find a spectacular master bedroom with vaulted ceilings and rooftop terrace overlooking Grand Canal. All this and located just 3 blocks from the beach, minutes to world-class shopping and Abbot-Kinney dining." "This stunning remodeled Craftsman is located on one of the most charming streets in Venice. The amazing location is in close proximity to the sand and near the hippest restaurants & shops of Abbott Kinney. California living personified, with an open floor plan expansive Living Room, Family Room, and Dining area. Gourmet Chef's Kitchen with top of the line stainless steel appliances, custom cabinets, designer finishes, and large walk-in pantry. Flooded w/natural light, this two-story home has 2 bedrooms downstairs, 2 upstairs, 4 baths and rich bamboo floors. Over-sized Master Suite offers spa-like bathroom w/ a large jet tub, separate shower, double sinks, vanity, and marble countertops. The rooftop deck is equipped with an outdoor kitchen w/built-in BBQ, perfect for entertaining while enjoying exquisite views and ocean breezes. This home has it all, including copper plumbing, tank-less water heater, Central AC/Heat, Alarm & Sonos Systems. There's also a separate guest house w/half bath"
"Stunning & recently reimagined Architectural retreat w/design by Kim Gordon, in coveted Windward Ave. strip of Venice! Amazing ocean & city views from the roof deck, perfect for dining & watching the sunset. Fall in love w/the open & spacious modern floorplan for entertaining & beach indoor/outdoor living. Channel your inner chef in the kitchen w/expansive island, Caesar counters, butcher's block, custom cabinets & pantry. The dining flows to the living room anchored by a contemporary fireplace & sliding glass doors to the courtyard w/fire pit. The bright master is perfect for unwinding, w/soaring ceilings & bath w/double shower, dual vanities, soaker tub & Terrazzo floors. Features include spa-like sauna, sophisticated guest bedrooms, laundry room & more. Relish beach living on the rooftop deck w/stunning downtown & ocean views, BBQ, custom seating, bar top & more, surrounded by landscaping. Moments from the beach, restaurants, shops & more, this Silicon Beach gem will not last long!" "Thoughtful details sprawl throughout 3,100 sq ft of this Architectural new construction. The open concept living area, which is perfect for entertaining, sits atop porcelain tile and is warmed by the leather-texture, black granite fireplace. Sleek contemporary cabinetry next to the custom-forged waterfall edged peninsula with Wolf and Subzero appliances highlight the kitchens allure. Control is at your fingertips with a home automation system that remotely connects everything from lighting to temperature, window shades and security. The master is its own getaway with beautiful barrel ceiling, fireplace, wet bar, spa-inspired bath, and walk in closet. Soak up quintessential Venice in this 4 bedroom / 4.5 bath home with coastline views from the master suite while enjoying privacy of the courtyard patio. Park with ease in your two-car garage and walk to nearby attractions of Abbot Kinney. A perfect blend of sophistication and Venice lifestyle awaits!"